Thank you Subway. Not that I touch any of your “sandwiches” but heck for those thousands, millions of people that do. At least if you can’t increase the nutritional value, keep the crap out! And, oh by the way, McD’s uses it in their McRib bun. 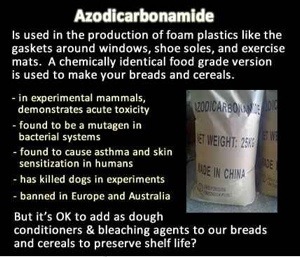 The world’s biggest sandwich chain says it’s in the process of removing the chemical known as Azodiacarbonamide from its sandwich breads — a chemical that Vani Hari, who runs the site FoodBabe.com, says is commonly used to increase elasticity in everything from yoga mats to shoe rubber to synthetic leather. via Subway to remove chemical from bread. Eat Fresh? Not so much.